Terrific ride. One of Australia’s most challenging rides due to the terrain, (plenty hilly), the heat, (there’s a lot of it), roads, (can be soft but usually not for long), traffic, (far, far too much of it), the sheer distance, but it’s also one of the most fun. The 4WD track components are the most memorable, Cape Melville, Frenchmans Track, the Pascoe River Station track and most of all the Telegraph Track, with plenty of opportunities for cooling off in the 26ºC creeks, sometimes a few hours between meeting fellow travellers, invariably in 4WDs, great campsites usually near water, there’s a lot to like. Great views, changing vegetation, from tropical rainforest to full on savannah, strange birdlife, (Palm Cockatoo, Brolga, Sarus Crane, Black necked Stork, etc) and then the (non-swimmable) beaches up north. The issue is that you really need a month or so to do it justice and that’s only getting up there, ie, one way. Cairns, North Queensland to The Tip of Cape York via a choice of routes including the famous Telegraph Track. around 1050km one way by the most direct route but it’s the variations that make this exciting. 1600km or more if you head into Iron Range or Weipa. The Hema Cape York, scale 1: 1,000,000, with the Telegraph Track at 1: 250,000 is essential for working out your route and where you will stay. allow 3 weeks (absolute minimum) to a month, each way. Some routes are slower travel than you might initially plan. There’s a bit to see up near The Tip as well, Thursday Island, fishing, etc. April to October inclusive. Not possible during the Wet when the rivers rise and can’t be crossed. June to August inclusive are the best months when it’s coolest and the rivers are low. Cape York, Queensland route in yellow. Supply points shown. Cairns has 8 bike shops with varying degrees of maintenance or repair skill and stocks of spare parts. There’s nothing much more as you head north, ie, be prepared with a reliable bike and sufficient spares, although Port Douglas has a small bike shop in the main street. There are many possible variations with major differences in exertion required. The obvious route is Port Douglas, Daintree River ferry, (don’t swim this one), Cape Tribulation, (road sealed to here), Bloomfield Track, Cooktown, Lakefield National Park, or for the intreped via the remote Cape Melville, (some walking the bike required), up the Development Road, Archer River, turnoff to Iron Range National Park and the 4WD only Frenchmans Track, (one tough day on this including the most difficult crossing of the trip, the Pascoe River), then up the essential Telegraph Track, the famous 4WD challenge, the Jardine River ferry, ($11 return for a bike + rider) and up to The Tip. Then you can either fly out from Bamaga or Horn Island near Thursday Island back to Cairns. It’s also possible to book a passage to Cairns on the weekly supply ship, leaves Mondays from the Seisia wharf. Book well ahead. Or repeat the dose, this time heading south. Each of these roads or tracks has its own issues. The main Peninsular Development Road has many gung-ho crazies who blat along at excessive speed considering the varying nature of the road, in places it can be frustratingly soft, although never for too long, ie, on and off hard work for a few km, strewn with deep pea gravel, although the bike rider can usually get around a lot of that, and what the 4WDers always ask about, what about those corrugations, (can get around most of those as well), and the dust. The Development Road is one of the few where there are still clouds of dust while it is raining and is a major danger when a convoy goes past in close formation, ie, they just can’t see you in the fog of dust. Every year there are a few headons as 4WDs smash into each other due to poor visibility. There are also 20+ rollovers each tourist season as the testosterone fuelled drivers lose control of their insane driving. That’s a problem for us on bikes. The traffic is very much more than what you might initially think, hundreds of 4WDs might shoot past every day on the main road during school holidays, after all there are about 50,000 visitors each Dry Season, most arriving at speed on a 4WD. The road surfaces vary. The main Peninsular Development Road is quite variable, it can be like a clay tennis court, that good, it’s an unsealed highway, ie, a fully formed road with various sections getting new clay added each year after having been washed away during the Wet, many parts are great, although it can have chunky gravel in the clay mix, to corrugated, either sand or the pea gravel, which can be occasionally graded but basically just has to be endured. The Bloomfield Track, Lakefield and Iron Range Roads are generally in considerably better nick, usually graded after each Wet Season. You should enjoy riding those. Taking the 4WD tracks is harder work but much better reward. The tracks, Cape Melville, Frenchmans, Pascoe River Station and the Telegraph Tracks are unformed and never graded, you just follow the 4WD ruts, the first two have considerable stretches of sand, the Telegraph has short bursts but is surprisingly easy riding for a good percentage. Pascoe River Station track is the pick. In general just expect plenty of variation and you won’t be disappointed. Not a problem, as they say, the creeks are not far apart. The water in the creeks is usually plentiful, clear and often fast flowing so you will probably survive even if you fail to filter, boil or chemically treat it. You will need the capacity to take sufficient water for overnight camping and riding for part of the next day occasionally. The water at the roadhouses and settlements is generally filtered. Cairns has a Woollies and Coles with national pricing, open 7 to 10 pm weekdays but closing earlier over the weekend. Port Douglas has a Coles in the main street, Mossman a small Woollies. Cooktown has a surprisingly big, busy and well stocked IGA but once you are out of there the options are few until The Tip. Musgrave, Moreton Station, Archer River and Bramwell Junction have takeaways with some competition as to who supplies the biggest and most expensive burger, Musgrave winning on both counts. Coen has a couple of small stores, not even IGA size, with expensive pasta, biscuits, oats, etc. Lockhart River, population around 900, has a good if expensive range as long as the supplies have come in. Some prices can be outrageous. Weipa, population 3500, has a Woolies but is off the usual track down a hugely corrugated road. Umagico, Bamaga, and Seisia, (the best range and cheapest), each have a supermarket that doesn’t really deserve the appellation, all open 7 days. Seisia is probably the most complete. The Thursday Island IGA is run by the same crew as the Bamaga and prices and stock are the same. You can’t bring fruit or meat back from Thursday Island. Basically you have to load up at either end for the Cooktown to Seisia stretch. Camping is a delight on this trip, there’s free spots at just about every creek crossing where you will be unlikely to be bothered by others, the more popular places have more spaces. Cairns has many expensive caravan parks, for the solo traveller one of the backpackers, around $22pp a night just out of the CBD might be a better bet, booking ahead can be worthwhile, this is a tourist area and places can fill up quickly during the souther winter. Port Douglas has Dougies where you can camp out the back in congested but convivial condition for $14 pp a night, there’s a pool and bar. PKs Jungle Village at Cape Tribulation is the obvious spot with a similar backpackers resort theme, ie, cheap beer and a swimming pool, $15pp. Cooktown has a choice of 5 caravan parks, some quite expensive as this is the termination for those dragging a caravan, the power point lacking Cooktown Caravan Park is $15pp a night but lacks facilities other than a shower and toilet. The national parks have a new, 2012, internet only booking system, something that could only be dreamed up by a capital city head office, which is particularly bike tourer unfriendly: there’s no reception out there and it can be hard to keep to a particular schedule. The system won’t let you complete a booking without filling in a car registration, you’ll have to make something up. Or completely ignore the system and just turn up. There’s a friendly, helpful mentality from the rangers who understand the bike rider’s predicament, but sadly are now unable to accept cash on site for the $5.50pp a night. The roadhouses at Musgrave, Moreton Station, Archer River, Bramwell Junction have limited facilities, usually just a patch of grass and some warmish water for a shower for a standard $10pp a night. Coen has a couple of campgrounds for $5pp, enquire at the pub or post office shop. Otherwise each creek has a few free sites that can be used without hassle, no facilities other than nearby running water but camping out like this is one of the great aspects of the trip. There’s a campground on the south side of the Jardine River at the ferry, $10. North of Jardine River there’s a few beachside camping grounds: Alau Beach at Umagico is terrific at $10pp a night, you camp 20m away from the high tide mark looking out to the islands and the setting sun but Seisia, $12pp, is next to the Thursday Island ferry wharf, Loyalty Beach and Punsand Bay are great camping on the beach $10pp. Watch out for the school holiday crowds during July when spaces can be tight. Port Douglas is worth a look, it’s relatively unspoiled considering it’s one of Australia’s most popular tourist destinations. The Mossman Gorge is one of Far North Queensland’s most popular, and free, tourist spots, worth a look but the water is cool. 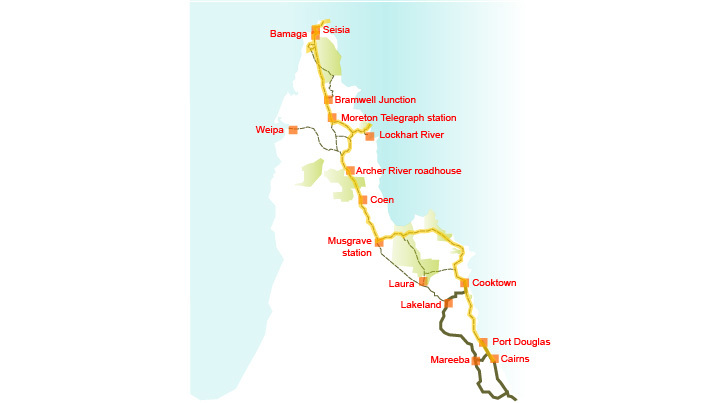 The Daintree, well, you are going on the ferry anyway, a big $1 each way for bike and cyclist. Consider a day off to climb Mt Sorrow at Cape Tribulation, when you get to the rope you know you are not too far from the tremendous view at the top. It don’t take the stated 5 or 6 hours return for a bikers fit thighs to climb, somewhat like half that. The Bloomfield Falls are a worth the short detour. Cooktown, unsurprisingly, has a few Cook monuments but the climb to Grassy Knoll is a must. Look for the resident freshwater croc at the Kalpowar Crossing out on the causeway. You might think that Chilli Beach is entirely over rated but the rainforest track getting there is terrific and Portland Roads is worth a look, the beaut cafe closes at 2pm. Crossing the Pascoe River on Frenchmans Track is one of the great experiences. This may well be where you first observe the strange 4WD fever that is exhibited by many others you will meet. The Gunshot Crossing is no longer the easiest way to smash up your brand new Landcruiser, there’s a newly created Chicken Run for those lacking in manly fortitude, the current stupid places to trash it are: Palm Creek crossing, man, you’d be nuts to drive down there; Nolans Brook, 22 vehicles required towing in the early part of 2012; and you can still tackle the Gunshot 4m sheer drop. People camp next to these crossings to watch others come to grief and end up with the iPads floating in the back seat as the cab fills with water. 50+ onlookers may all be filming the action on their iPhones, etc. Fruitbat Falls and the close by Eliot and Twin Falls have great swimming although you will be in close proximity with the main bulk of the 4WD travellers. There’s plenty of other less well promoted creeks and rivers to splash around in to cool off as well. The Tip is what all this is about but you may be completely underwhelmed when you finally make it. The Thursday Island ferry trip, $112pp, is worth it for the day, if you can’t book ahead and it’s full try to get on anyway down at the Seisia wharf at 7 30am. Visit the 1893 gun emplacement on Green Hill and just contemplate that water colour. Also don’t miss out on the legendary Crayfish pies at the sporadically open takeaway on the foreshore road. Not required, except for the area immediately south and everything north of the Jardine River. Your ferry payment gives you a permit for access for camping etc in this area. There’s a few warnings in order. Predominantly it’s taking care on the Peninsular Development Road and the dust perils where it’s easy to fall prey to a tailgating 4WD. There can be 100s of cars on that road each day, 50,000 make it to The Tip each tourist season, most travelling by 4WD. Having flashing LED lights would be some advantage during the school holidays. Those drivers are insane, 4 died in car accidents in 2011. Bike parts aren’t so easy to come by so be prepared with spare tyre, tubes, etc, the limestone based road can be harsh on the wheels. Food is a major issue. Stock up when you can. The crocs are much discussed but perhaps a much overrated fear. When you get to the creeks many are ankle deep and saltwater crocs are unlikely during the Dry Season. There is plenty of traffic to scare them away from the crossings. The big rivers: Wenlock at Moreton Station has a big bridge and the Jardine has a ferry which takes crocs out of the equation. Read my personal blog account of Cape York starting in Cairns. Or read someone else’s trip in August – September 2007 Ed and Gaye Bourke, and Mark Polley cycled from Cairns to Cape York and back. These guys were the inspiration for my own procrastinations through Cape Melville National Park and Iron Range National Park, some of fun-ist riding you can do in Australia. Anthony Mann made it up to The Tip on his 7 extreme points of Oz bike adventure. And of course, Queen of the OZ Outback Dirt Tracks, Mirjam’s Little Adventure. These 32 + 30 images give a general impression of the road, umm, track, conditions and water sources you are likely to encounter out there. And just a few pretty pictures too.